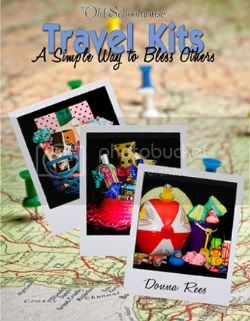 Today's review is an e-book from The Old Schoolhouse called Travel Kits: A Simple Way to Bless Others. This was a fun review that I found perfect for summer time weather! In this e-book you will find lots of ideas for putting together travel kits for your family or as a gift to other families. The book starts out describing kits you can assemble as a way to make car trips more fun for families who have to travel whether it be a 1 hour trip or a 14 hour trip. A long trip in a car with an unhappy 2 year old can be a nightmare! And buckets can come in handy sometimes - don't ask me how I know!! As I continued to read I was thinking this really doesn't apply to our family that much. We don't travel a lot as a family. All of our families live pretty close by. My kids are way past the toddler stage. And then I kept on reading and discovered that the ideas in this e-book go well beyond that of a traveling family. The ideas you will find can be tweaked to fill a basket, bucket, bag or any item to bless a family in almost any situation! You could make kits for new college students, kids going away to camp, missionary families, your pastor's family during vacation, a simple trip to the dentist, a soccer game, etc. The possibilities are really endless! Inside the e-book is loaded with what you can put inside your travel kits. I am going to print this out as a manual to go on our bookshelf because it is loaded with ideas that I could use as a resource in our home. This would be great to use as a ministry for our homeschool too. There is nothing more educational than sharing the love of Jesus with others! If you would like to see a sample of TOS Travel Kits e-book click here. The price of TOS Travel Kits: A Way To Bless Others is $12.45 and can be instantly downloaded by clicking here. You can find out what my crew mates have to say about this e-book by going to The Crew Blog. The Oldschoolhouse store has loads of other products that you can explore here.